In Diane Frank's poetry, 'The light,' to use her own words, 'is always a surprise.' This is a journey made with luminous eyes. Not since William Blake has there been a poet who has seen so much heaven in our world, where 'an angel will surprise you/... in the swirling blue translucence/ of a long window of Venetian glass.' Her vision is timely and what we've been thirsting for. 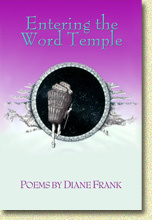 Don't hesitate to follow her energized voice into this Temple of Words! Tomas Transtromer once said that his poems are meeting places for souls. In this world where one does not always feel entirely at home, it is with a sense of recognition that one enters a Diane Frank poem, with all its exotic quirks, and rather than feel it to be strange, feel it to be a habitable, companionable place of kindred spirits. Diane Frank can enter, at will, that region where visions reveal themselves like snapshots. She transcribes these as jewel-like images on the page, through a vocabulary steeped in the natural world and the insistent predilections of the human heart. Diane Frank crafts more than words, she brews word medicine. I feel her syllables like salve penetrate my skin to heal deeply hidden wounds.